Parents Trust Us – Kids Love Us! 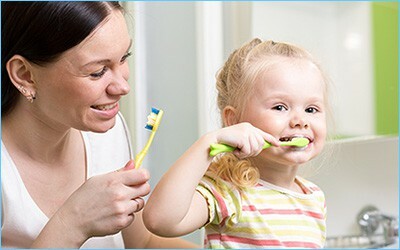 months of age) receive proper dental care and benefit from proper oral hygiene habits right from the beginning. 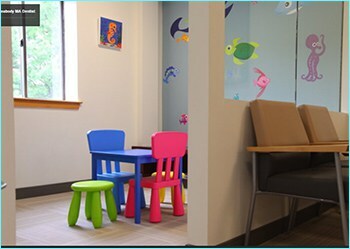 Great Hill Dental in Braintree understands the importance of your child’s visits to the dentist. We build a trusting relationship with both you and your child, and make sure each visit is as pleasant, interesting and fun for your child as possible. Your child’s first primary or baby teeth will begin to erupt between the ages of six and twelve months, and will continue to erupt until about age three. During this time, your child’s gums may feel tender and sore. To help alleviate this discomfort, we recommend that you soothe the gums by rubbing a clean finger or a cool, wet cloth across them. You may also choose to make use of a teething ring. When your child has finished teething, you can expect a total of 20 primary teeth. Tooth decay is caused by sugars left in your mouth that turn into an acid which can break down your teeth. Children are at high risk for tooth decay for a simple reason, many children and adolescents do not practice regular, good oral hygiene habits. Proper brushing and flossing routines combined with regular dental visits help keep tooth decay away. Call or use our form below and make an appointment – we promise we’ll exceed your – and your child’s – expectations!